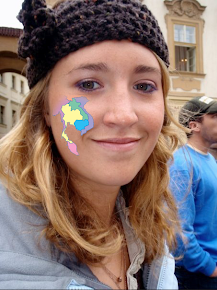 Travel on My Face: Vegetarian Festival - A Bloody Good Time! Vegetarianism is taken to the extreme in Phuket and Bangkok every late September to early October for about 10 days during the annual Vegetarian Festival. Large Chinese populations celebrate a holiday where they don’t eat meat and respect Buddhist beliefs of mind and body cleansing. Everyone who attends the event is supposed to wear white to show purity. Pregnant women and girls on their period are encouraged not to attend the festival because everything must remain untainted. The few of us were the only white people around for miles and although we wore all white clothing to the festival we stuck out like a sore thumb. 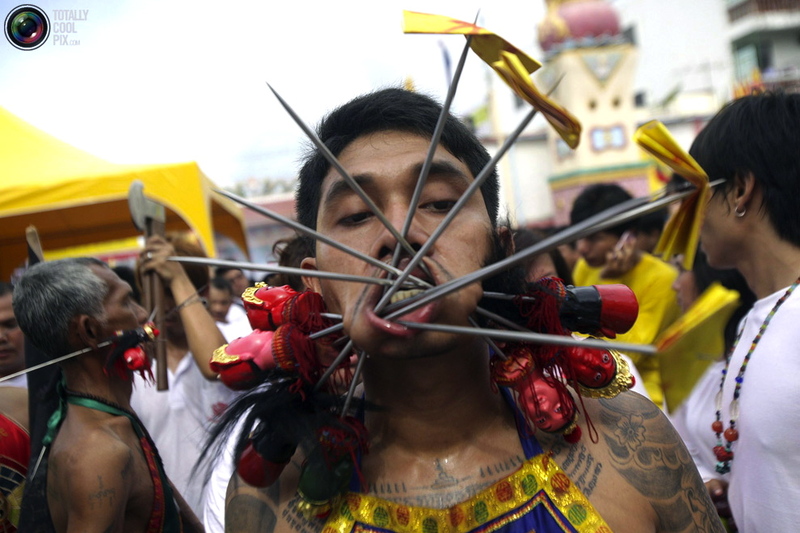 The locals performed gruesome self-mutilation tactics like stuck swords through their cheeks, walk on fire, and pierce their arms with a variety of different sharp objects. It is actually an extremely gory event. The people who perform the injury to their bodies are called Mah song because they ask the gods’ spirits to come into their bodies and protect them so they don’t feel pain. Unmarried men and girls’ without husbands and children are invited to become Mah song, otherwise only pure people. The Mah song participants partake in several rituals in the Chinese temple to protect them during the festival. Thai people are very into the power of spirits and deem that much of life on earth is due to how well we treat and respect life forces around us. Michele and I with some festival goers in front of the Chinese temple. Residents make the Vegetarian festival a family affair too, bizarre. Loud parades through the streets and fire breathing are enough to scare off tourists and meat eaters! I am both and although I wanted to see the swords slice through the faces of Thai natives, I actually missed the main parade. With all the traffic to and from, we missed the focal point but some of my friends saw the action and said it was not a pleasant experience. By the time I arrived in Phuket Town where the hustle and bustle happened, I got to go inside of a Chinese temple where people gave offerings and burned incense to Chinese gods. There were tons of statues and in every color of the rainbow. The detail on the outside and inside of the temple was so ornate and meticulous. Debris from firecrackers filled every inch of the streets like confetti. In front of the temple, men who participated in the festival’s self sacrificing events were covered with dried blood and some who were still in severe pain were carried away with the support of friends. I guess the protection from the spirits wore off. Men and women were cooking vegetarian delights and selling the treats up and down the street. We enjoyed chowing down on some vegetarian grub and checking out all the aftermath of the festival. I found a cool website with pictures from this year’s Vegetarian Festival in Phuket. WARNING: DO NOT LOOK AT THESE PICTURES IF YOU HAVE A WEAK STOMACH!! http://totallycoolpix.com/2011/10/vegetarian-festival-in-thailand/. If you want to learn more about the Vegetarian Festival, visit the website for upcoming dates, photos, rules and history: http://www.phuketvegetarian.com/index_eg.htm. I should've taken your advice, that was awful. Just awful. Can you believe people actually pierce their faces like that? !